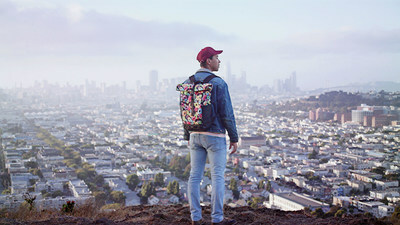 SAN FRANCISCO, Aug. 1, 2017 /PRNewswire/ -- The creative minds and bold brains at Timbuk2 have partnered with Kellogg's® Froot Loops® to create a backpack fit for any adventure, anytime, anywhere – so you can do "Whatever Froots Your Loops," whenever it comes calling. 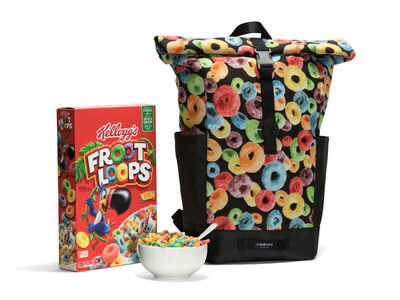 The limited-edition Timbuk2 x Froot Loops Tuck Pack was developed by industrial designer Alexis de Coninck and global brand marketing manager Michelle Nadeau. At Timbuk2 – a company all about fearlessly shaking up the status quo – the two visionaries work and live the "Whatever Froots Your Loops" mantra of staying true to yourself and enjoying every minute of it. "To me, 'Whatever Froots Your Loops' is about being excited and prepared for whatever comes your way in life, so we've designed the Timbuk2 x Froot Loops bag for just that," said Coninck. "Every person has a different adventure that Froots their Loops, and our goal with this bag is to ensure fans have everything they need to jump right in and explore the world around them." Retailing for $100, the limited-edition collaboration includes only 100 bags available exclusively at Timbuk2's Manhattan storefront at 325 Lafayette St. and timbuk2.com/frootloops. Riding the heels of the June launch of the Neff + Froot Loops Toucan SamTM Shades, the Timbuk2 collaboration is the second of three epic "Whatever Froots Your Loops" partnerships. Later this summer, Froot Loops will team up with State Bicycle Co. co-founders Mehdi Farsi, Reza Farsi and Eric Ferguson. For more information, follow Froot Loops on Facebook and Instagram, as well as Timbuk2, Neff Headwear, and State Bicycle Co. on Facebook, Twitter and Instagram. About Kellogg Company At Kellogg Company (NYSE: K), we strive to make foods people love. This includes our beloved brands – Kellogg's®, Keebler®, Special K®, Pringles®, Kellogg's Frosted Flakes®, Pop-Tarts®, Kellogg's Corn Flakes®, Rice Krispies®, Cheez-It®, Eggo®, Mini-Wheats® and more – that nourish families so they can flourish and thrive. With 2016 sales of $13 billion and more than 1,600 foods, Kellogg is the world's leading cereal company; second largest producer of crackers and savory snacks; and a leading North American frozen foods company. And we're a company with a heart and soul, committing to help create 3 billion Better Days by 2025 through our Breakfasts for Better Days global purpose platform. To learn more, visit www.KelloggCompany.com or www.OpenforBreakfast.com and follow us on Twitter @KelloggCompany, YouTube and on our Social K corporate blog.